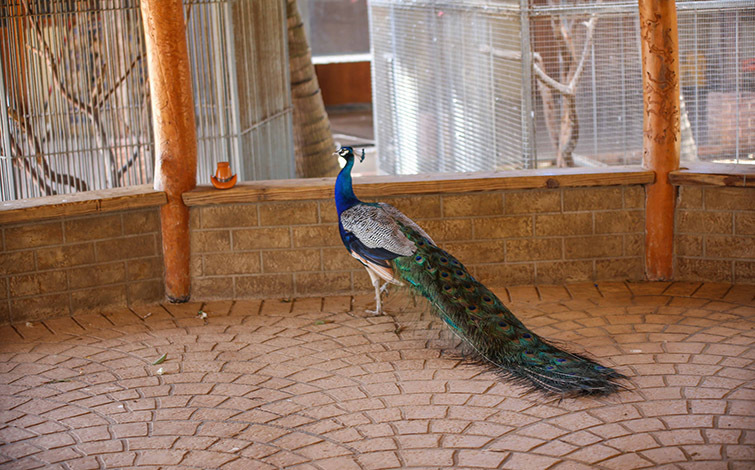 Peacocks are best known for the male’s extravagant tail, which it displays as part of courtship. The male is called a peacock, the female a peahen, and the youngster a peachick. The female is brown or toned grey and brown. The male Indian Peacock has iridescent blue-green or green colored plumage. The so-called “tail” of the peacock, also termed the “train,” is not the tail quill feathers but highly elongated upper tail coverts. The train feathers have a series of “eyes” that are best seen when the tail is fanned. They are forest birds that nest on the ground but roost in trees. They are terrestrial feeders.